Other titles: "Cakes of Crowdy", "Bonox of beare meal", "The Fisherman's Frolic"
First published in Margaret Sinkler's manuscript of 1710. Related songs: "Bannocks O' Bear Meal"
The good of the land's the sole motive I know. Now I'll feast upon bannock o' barley-meal. 2. Ye riots and revels of London, adieu! And Folly, ye foplings, I leave her to you! While she shares my bannocks o' barley-meal! Oh, may he be worthy to wear't on his side! And feast upon bannocks o' barley-meal. Le bien de mon pays, voilà ma passion. Méritant le gâteau d'orge que voici. 2. Emeutes et fêtes de Londres, adieu! Je laisse aux dandys tous ces plaisirs oiseux! Les lieux charmants des Highlands je les parcours. De goûter avec elle au repas frugal! Puisse-t-il être digne de la porter! Vite un gâteau d'orge: je l'ai mérité! This is another text in relation with Jacobitism matching "Bannocks O' Bear Meal" or similar tunes. It was contributed by Sir Alexander Boswell to the third volume of George Thomson's "Collection of Scottish Airs", on which Burns collaborated in addition to the "Musical Museum" as from September 1792. Alexander Boswell was the oldest son of James Boswell, the famous biographer of the not less famous poet, critic, essayist and lexicographer, Dr Samuel Johnson 1709-1774). It is not wholly original, but an improved version of former words to the same air. The original is attributed to John Campbell, Duke of Argyle, who died on 4th October 1743. However, the song may be older: if the name of Maggie is correct, it would refer to the first Marquis of Argyll, whose wife was Lady Margaret Douglas. He was "so very notorious a coward that this song could have been made by nobody but himself, unless to turn him into ridicule. "(Note to The Scots Musical Museum). A song on another (or is it the same?) 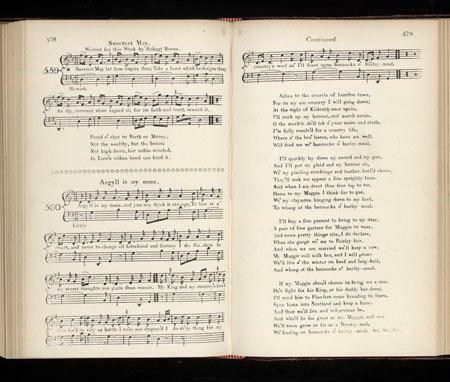 Argyle of the eighteenth century with the title "Kist the Streen" is to be found in "Songs from Herd's MS" edited by Hans Hecht (1909), under N°34, page 138. Source: "Complete songs of Robert Burns Online Book" (cf. Links) Voici d'autres paroles pour le chant "Bannocks O' Bear Meal" ou d'autres qui lui ressemblent, liées, elles aussi, au Jacobitisme. Elles furent envoyées par Sir Alexander Boswell pour être publiées dans le troisième volume de la "Collection d'Airs Ecossais" de Thomson à laquelle Burns contribua, outre le "Musée Musical" à partir de septembre 1792. Alexandre Boswell était le fils aîné de James Boswell, le célèbre biographe du non moins fameux poète, critique, essayiste et lexicographe, Dr Samuel Johnson (1709 -1774). Elles ne sont pas complètement originales, mais une version améliorée de l'original. L'original, quant à lui, est attribué à John Campbell, Duc d'Argyll, qui mourut le 4 Octobre 1743. Cependant, ce texte pourrait être plus ancien: si le diminutif "Maggie" est exact, il s'agirait du premier Marquis d'Argyle, dont l'épouse était Lady Margaret Douglas. "C'était un poltron d'une telle notoriété que ce chant n'a pu être composé que par lui-même, à moins qu'on ne l'ai écrit pour le tourner en ridicule." (Note pour le "Scots Musical Museum"). Un chant sur un autre (ou sur le même?) Argyll du 18ème siècle et intitulé "Kist the Streen" se trouve dans les "Manuscrits de Chants" de Herd, édités en 1909 par Hans Hecht, sous le n°34, page 138.